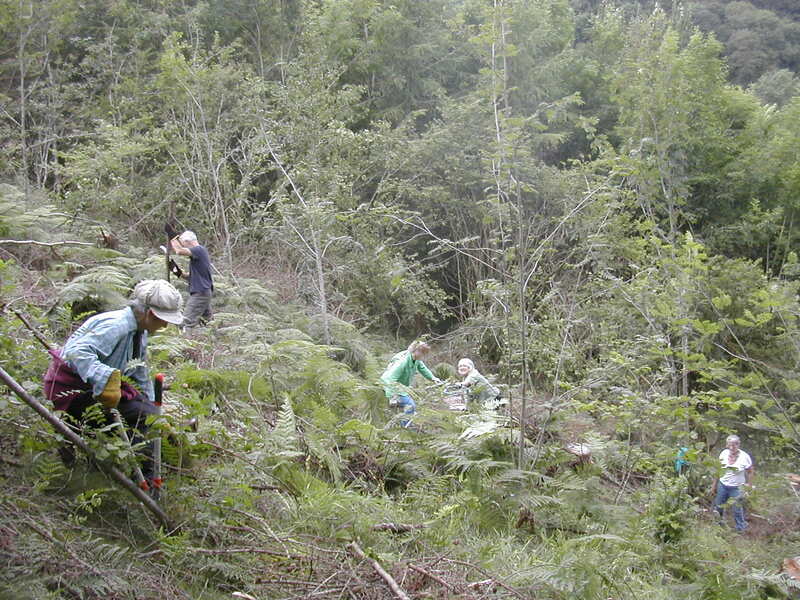 Do you want some fresh air and exercise while being sociable and helping local wildlife? Then you’ve come to the right place! The April to September 2019 programme of KTAT task days in local woodlands can be seen below under “Our Current Programme” or downloaded here as a pdf file: KTAT Task Programme April-Sept 2019. 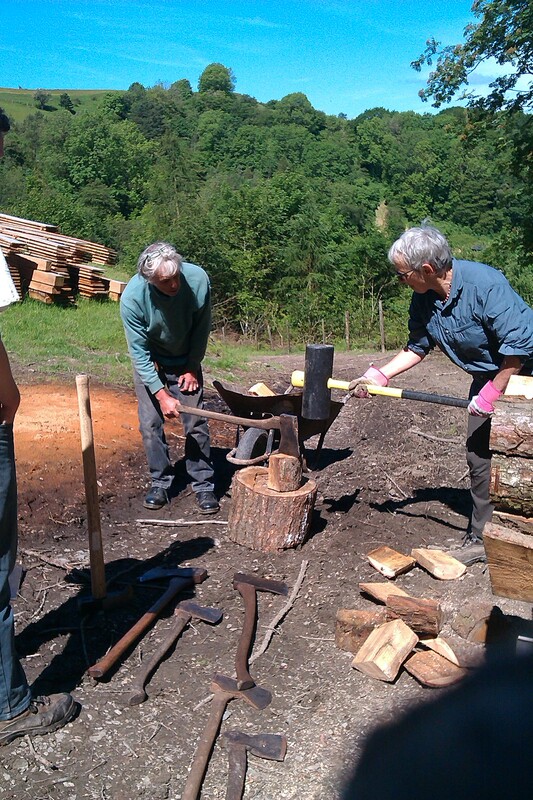 Knighton Tree Allotments Trust offered this training course to those who would like to know more about the management of small woodlands and sustainable woodland products such as firewood. The training ran over 3 Saturdays in January 2019 in and around Clun and was very successful. Day 1 of the training was classroom based and introduced participants to the theory of woodland management, giving them a greater appreciation of how we can utilise woodlands for the sustainable growth of products whilst protecting and enhancing biodiversity. Days 2 and 3 were focussed on practical training in how to select trees for felling, how to safely cut small trees using hand tools, how to extract and season wood and how to process wood into logs. 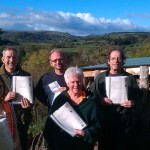 This training was provided by Knighton Tree Allotments Trust and was partly funded by the Shropshire Hills Area of Outstanding Natural Beauty (AONB) Conservation Fund. KTAT organised a free training session on Preventing, Identifying and Reporting Tree Diseases by Barnaby Wilder of the Forestry Commission. 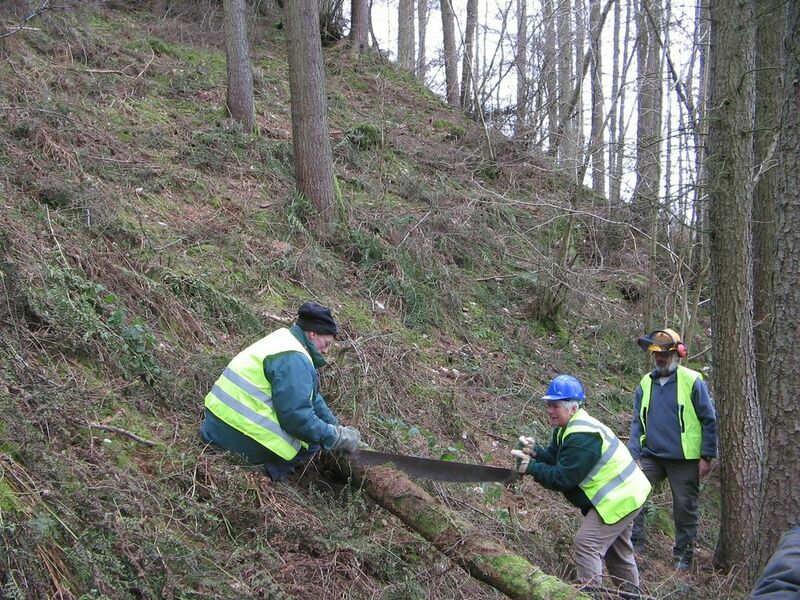 There is widespread concern about the spread of diseases such as ash dieback and Phytophora ramorum so we asked the Forestry Commission to come and advise our volunteers and the general public on what we can actually do. The training took place at Knighton Community Centre on Wednesday 11th July 2018 and was well attended. Watch this space for future training opportunities. KTAT is delighted to have received a further donation of £2,345 from Nisa’s Make a Difference Locally scheme via the Knighton Tuffins store (now part of the mid-counties Co-operative). This kind of support for our work allows us to continue to offer volunteering and training opportunities to local residents and to benefit the wildlife in our local woodlands. Thank you Nisa! Read all about what KTAT has been doing from Spring 2017 to Spring 2018. KTAT would like to say a big “thank you” to 3 companies and local shoppers for their support of our work. We have just received a donation of £350 from the Make A Difference Locally scheme run by Nisa grocery stores. Bucknell-based Hornsea Steels has kindly donated materials to repair the roof of our wind-damaged tool shed. We have also received £1,000 from the Bags of Help scheme at the Llandrindod Wells Tesco store following a public vote. This kind of local support allows KTAT to carry on its valuable work in local woodlands, so we would like to thank those companies and those of you who voted for our project at Tescos. It is a common misconception that unmanaged woodland is best for wildlife. In fact, by managing the woodland through traditional practices such as coppicing, we increase the variety of habitats and increase the richness of wildlife. In ensuring that the trees that we fell for fuel or timber are replaced with new plants, we are creating a sustainable supply of woodland products. In sustainably growing firewood and other woodland products we can meet some of our fuel and food needs as well as reducing our carbon footprints. At the same time we are joining co-operatively with other local people to enjoy, conserve and enrich our local environment. So why, as a conservation group, do we cut down trees? There are several reasons for this. First of all, sometimes we are simply harvesting a crop. Most broadleaved trees, when coppiced (cut almost to ground level), will re-grow and can be harvested again in a few years – how many years depends on the site conditions and what size of wood you need: beanpoles can be harvested after 3 to 4 years whereas firewood takes 8 to 15 years. Trees can last for centuries being cut like this. Sometimes we want to give certain trees more space and light to enable them to grow larger and fatter, so we fell the trees around them. At other times you might have a whole woodland of trees the same age – a plantation – where, like in a vegetable garden, you have sown or planted more trees that you need in order to later select the best and strongest to grow on to maturity. It might be that a tree is so damaged by grey squirrels, deer, weather or other factors that it is removed to give the remaining trees more light. Although, at other times, we deliberately leave dead trees standing as they provide a good home for birds, bats, bugs and fungi. In the past large herbivores such as elk, moose, bison, wild boar and aurochs – and their predators – would have made the woodland a dynamic environment, constantly changing and varying due to grazing, rooting, and digging. In the absence of these creatures the environment becomes static and things like ground flora decrease. By managing woodlands through coppicing or thinning we are providing change, increasing habitats and supporting woodland species. We go out to local woodlands one day a week, usually alternating between Thursdays and Sundays, and volunteers choose how much of the day to stay for. Volunteers work at their own pace and KTAT provides all the tools and training needed. So come and learn new skills while helping local wildlife. 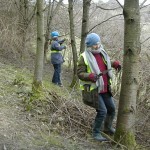 For more information on the workdays, and to find out how to join in, please contact us via email woodland@tveg.org.uk or telephone 01547 520374. Trees need to be planted, coppiced (cut back almost to ground level then re-grown) or felled when they are dormant. We also need to be careful not to disturb nesting birds. 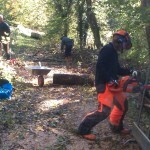 For these reasons, most woodland work is carried out in autumn and winter. Summer is a time of clearing up from our winter work, keeping newly planted trees free from weeds and cutting cordwood (4 foot long pieces of wood) into logs. Summer is also a time for training – in summer 2018 we ran a training course on Preventing, Identifying and Reporting Tree Diseases, in association with the Forestry Commission. In 2017 we worked with the Woodland Trust to provide training on ‘Identifying Ancient Woodland Indicator Species’ and ‘Tree Identification and Introduction to Basic Woodland Management Techniques’. Thursday 4th April – 9.30am to approximately 2.30pm We will be weeding around the young trees to make sure that grass, bracken, etc., do not take water and nutrients from the trees. Sunday 14th April – 9.30am to approximately 2.30pm We will be extracting the timber that has arisen from thinning the birch trees over the winter. 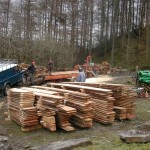 We will also be cutting this timber into logs and stacking it to season. 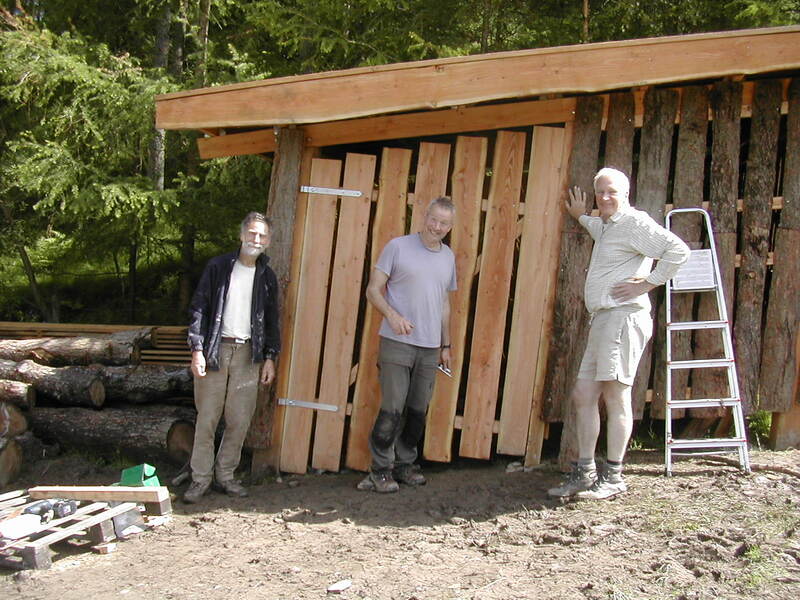 The cordwood will be cut to log length using a chainsaw, with larger diameter pieces also split with axes. 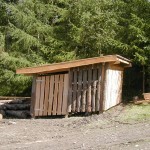 The logs will be stacked onto pallets, and a cover placed on top, to continue the seasoning process. 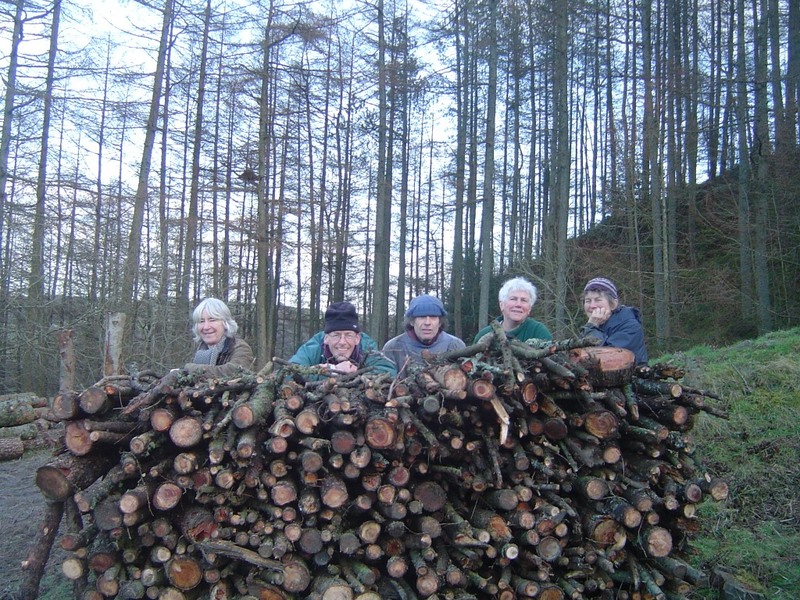 Thursday 18th April – 9am to approximately 4pm – PLEASE NOTE DIFFERENT START AND FINISH TIMES We will be moving all of our cordwood from the edge of the site and into the car park, then cutting it into logs ready for Volunteer Members to collect. Sunday 28th April – 9.30am to approximately 2.30pm We will be extracting the timber that has arisen from thinning the birch trees over the winter. We will also be cutting this timber into logs and stacking it to season. 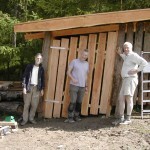 The cordwood will be cut to log length using a chainsaw, with larger diameter pieces also split with axes. The logs will be stacked onto pallets, and a cover placed on top, to continue the seasoning process. Thursday 2nd May – 9.30am to approximately 2.30pm We will be extracting the timber that has arisen from thinning the birch trees over the winter. We will also be cutting cordwood into logs and stacking it to season. Please see Sunday 28th April for details. Sunday 12th May – 9.30am to approximately 2.30pm We will be extracting the timber that has arisen from thinning the birch trees over the winter. 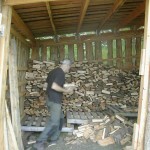 We will also be cutting cordwood into logs and stacking it to season. Please see Sunday 28th April for details. Thursday 16th May – 9.30am to approximately 2.30pm We will be extracting the timber that has arisen from thinning the birch trees over the winter. 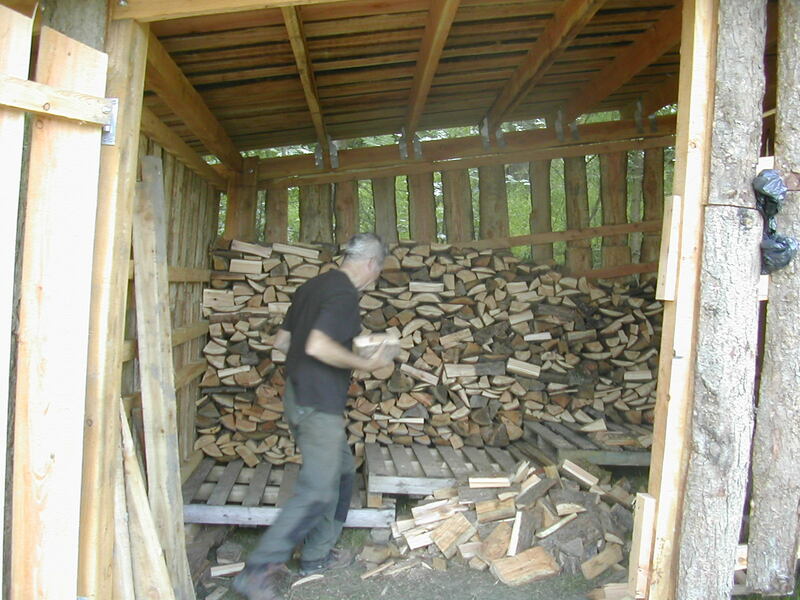 We also will be cutting cordwood into logs and stacking it to season. Please see Sunday 28th April for details. Sunday 26th May – 9.30am to approximately 2.30pm We will be extracting the timber that has arisen from thinning the birch trees over the winter. We also will be cutting cordwood into logs and stacking it to season. Please see Sunday 28th April for details. 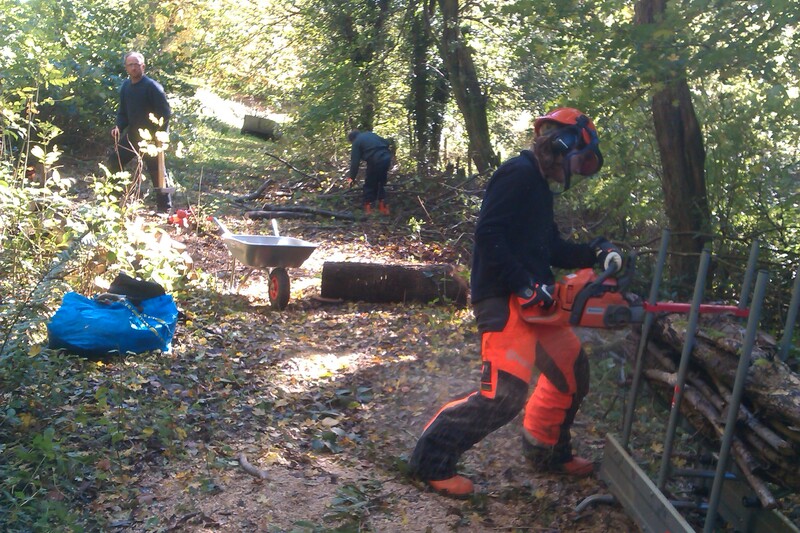 Thursday 30th May – 9.30am to approximately 2.30pm We will either be extracting the timber from one wood ready for Volunteer Members to collect, or cutting cordwood into logs and stacking it to season at a different wood. 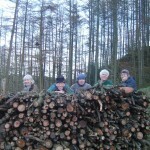 Sunday 2nd June – 9.30am to approximately 2.30pm We will either be extracting the timber from one wood ready for Volunteer Members to collect, or cutting cordwood into logs and stacking it to season at a different wood. 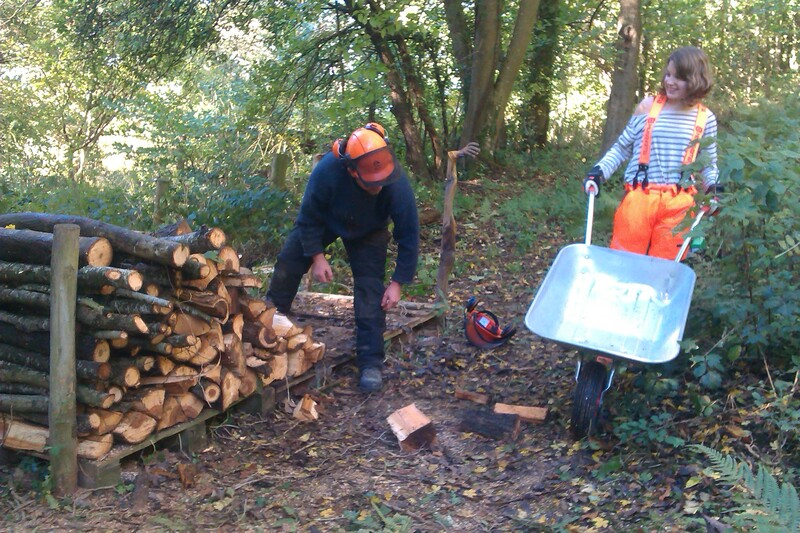 Thursday 6th June – 9.30am to approximately 2.30pm We will either be extracting the timber from one wood ready for Volunteer Members to collect, or cutting cordwood into logs and stacking it to season at a different wood. 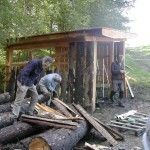 Sunday 16th June – 9.30am to approximately 2.30pm We will be cutting cordwood into logs and stacking it to season. Please see Sunday 28th April for details. 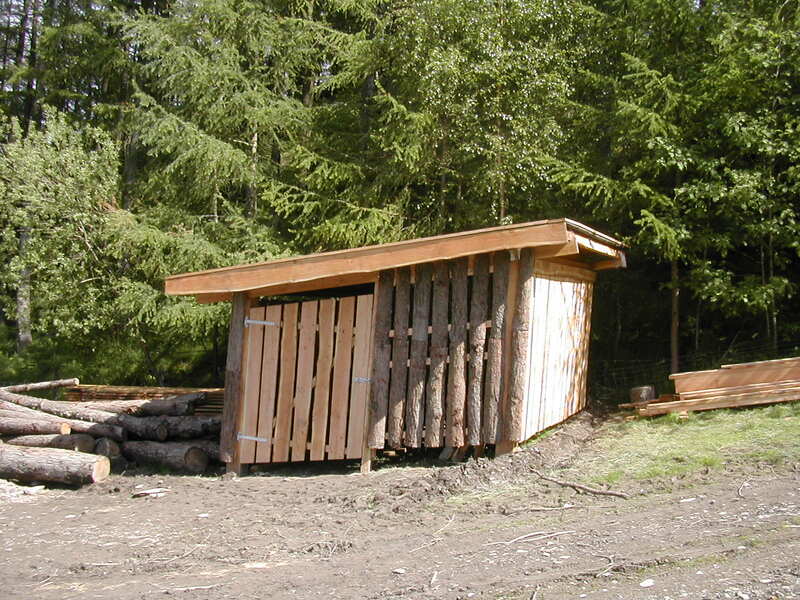 Thursday 20th June – 9.30am to approximately 2.30pm We will be cutting cordwood into logs and stacking it to season. Please see Sunday 28th April for details. 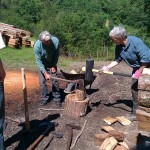 Sunday 30th June – 9.30am to approximately 2.30pm We will be cutting cordwood into logs and stacking it to season. Please see Sunday 28th April for details. Thursday 4th July – 9.30am to approximately 2.30pm We will be carrying out our second weeding around young trees to make sure that grass, bracken, etc., do not take water and nutrients from the trees. Sunday 14th July – 9.30am to approximately 2.30pm Tool inventory day – checking, sharpening and generally maintaining our tools. 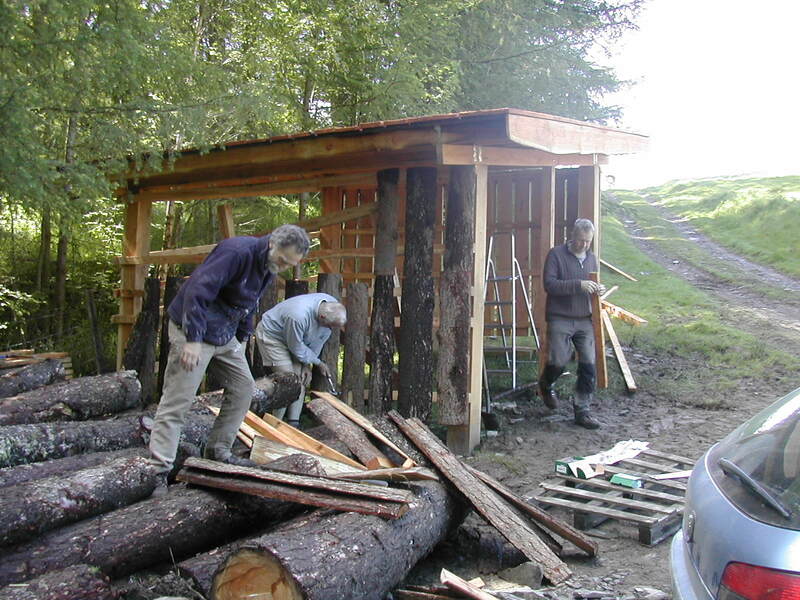 We will also be cutting cordwood into logs and stacking it to season – please see Sunday 28th April for details. Thursday 18th July – 9.30am to approximately 2.30pm We will be cutting cordwood into logs and stacking it to season. Please see Sunday 28th April for details. Sunday 28th July – 9.30am to approximately 2.30pm We will be cutting cordwood into logs and stacking it to season. Please see Sunday 28th April for details. 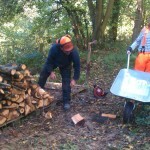 Thursday 1st August – 9.30am to approximately 2.30pm We will be cutting cordwood into logs and stacking it to season. Please see Sunday 28th April for details. Please note that there are no other task days in August. Sunday 8th September – 9.30am to approximately 2.30pm Thinning birch trees in a young woodland. Now that the nesting season is over, we can reduce the number of birch trees to favour the hazel coppice and the other trees in the wood – oak, rowan, beech, willow and ash. We do not want the birch to grow back so we can cut them when they are in leaf. The birch will be felled, cut to cordwood and extracted to start the seasoning process. Thursday 12th September – 9.30am to approximately 2.30pm Thinning birch trees in a young woodland. Please see Sunday 8th September for details. Sunday 22nd September – 9.30am to approximately 2.30pm Thinning birch trees in a young woodland. Please see Sunday 8th September for details. Thursday 26th September – 9.30am to approximately 2.30pm Thinning birch trees in a young woodland. Please see Sunday 8th September for details. Please note that these dates are subject to change and that factors such as bad weather can prevent task days from going ahead. 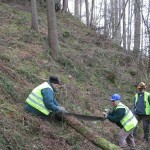 We also sometimes need to adjust the programme to meet the requirements of volunteers and woodland owners. 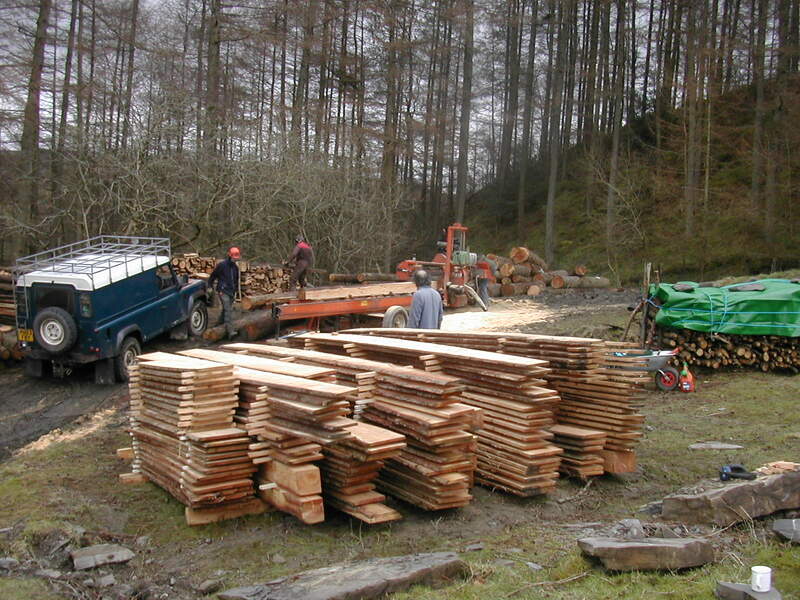 We recognise the local need to provide wood for fuel and other woodland products, whilst maintaining healthy vibrant woodlands for wildlife and ensuring biodiversity for future generations. We aim to provide the woodlands our community needs for a sustainable future and are now looking for land and woodlands to lease or manage, preferably within a 9 mile radius of Knighton, though we will consider further afield. Please contact woodland@tveg.org.uk or tel. 01547 520374 if you have any land that might be suitable. We currently have Five Trustees who have taken on various responsibilities: Camilla Saunders, Jamie Ritchie, Annie England(Secretary), Robert Todd and Kate Mclean. Each year we hold an Annual General Meeting (AGM) where Members, Trustees and Volunteers come together to find out how the Trust is doing and to decide on our next steps. Members of KTAT vote for the Trustees who make the day-to-day decisions on behalf of the Members. Our AGM for 2018 was held on Thursday 17th May 2018 at Knighton Community Centre at 7.30pm and a report can be found here Annual Report for 2018. 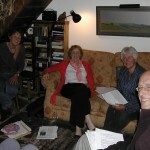 To find out what was discussed and decided at previous meetings please follow the links below. Our AGM for 2017 was held on Thursday 11th May 2017 at the Offa’s Dyke Centre at 7.30pm and a report can be found here: 2017 Annual Report and Accounts. Our AGM for 2016 was held on Thursday 5th May 2016 at the Offa’s Dyke Centre at 7.30pm and a report can be found here. Our AGM for 2015 was held on Thursday 16th April 2015 at Knighton Community Centre at 7.30pm and a report can be found here. 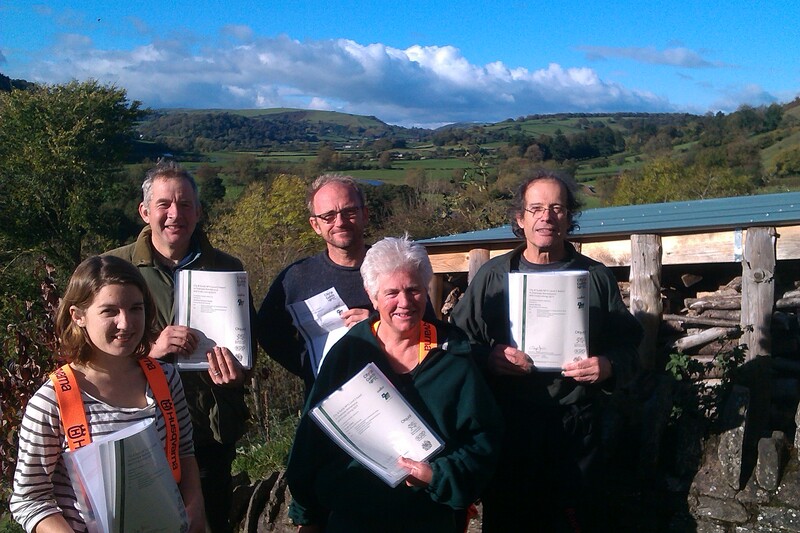 Our AGM for 2014 was held on Tuesday 25th March 2014 at the Offa’s Dyke Centre at 7.30pm and a report can be found here. 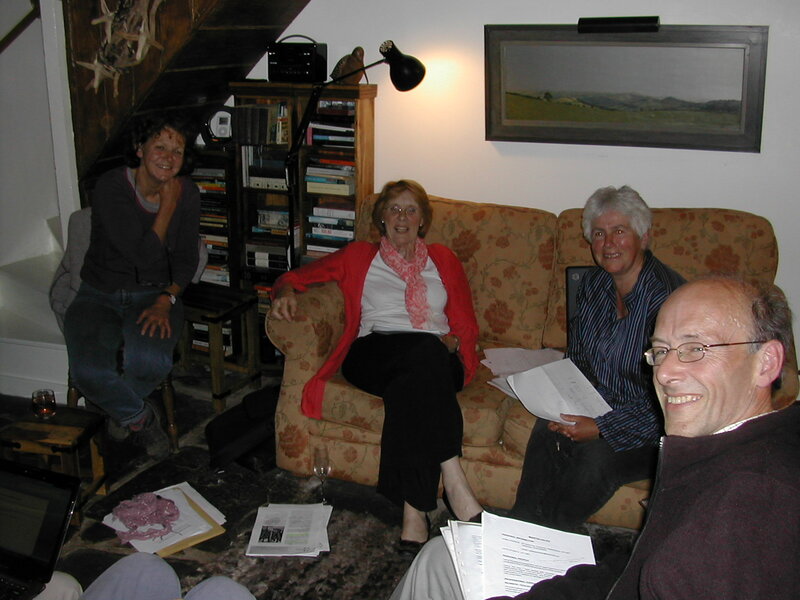 Our AGM for 2013 was held on Thursday 25th April 2013 at the Offa’s Dyke Centre at 7.30 p.m. and a report can be found here. 6. acquiring lands whether freehold or leasehold, with or without buildings and fixtures, and of a character, size and location to be decided by the Trustees. Please click on the link below for more information. Knighton Tree Allotments Trust – Memorandum and Articles of Association. 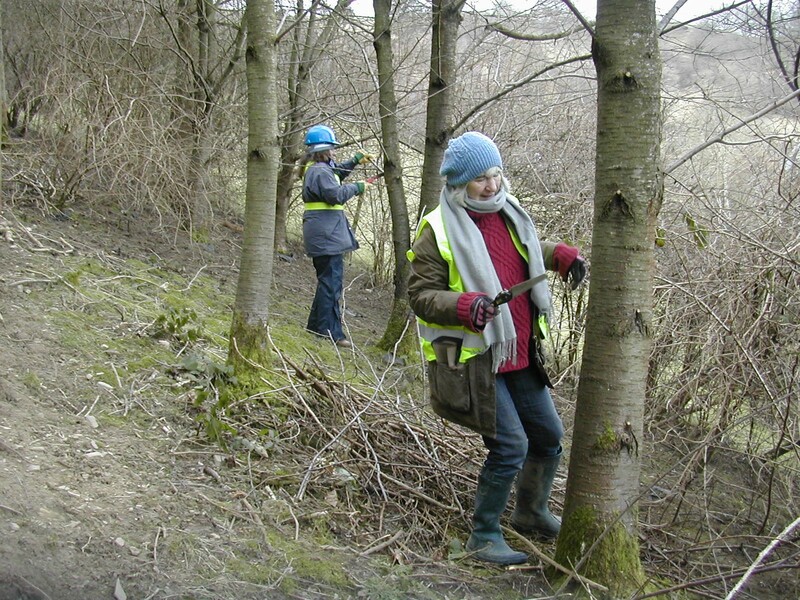 Our aim is to “manage woodlands for the benefit of woldlife and our members”. But how do we know that we are achieving this? We carry out regular flora and fauna surveys, the results of which can be found here. 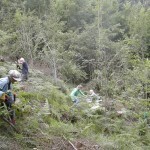 Photographs of some of the activities you can be part of by volunteering.